This article first appeared at American Lens News on November 14, 2016. Durham, NC – Chaos has descended on the Durham County Board of Elections following Election Day irregularities. At least one official complaint was filed on November 11, 2016, and the high potential for others could have far-reaching effects across the state. The alleged issues took place during the entire 17-day early voting period and into Election Day at more than five precincts in Durham County. The complaint lodges an accusation of official misconduct. The number of questionable ballots is estimated at approximately 90,000 and as high as 94,000. As a result, the balance of two top races remains clouded in doubt. The complaint of official wrongdoing by elections officials provides a rare glimpse at the process of calculating votes that are seldom spoken about or witnessed by the general public. The board consists of two Republicans and one Democrat member. If the allegations withstand scrutiny, North Carolina could be waiting a lot longer before the outcomes of the affected races can be certified by the state. Such is the case with the NC Governor and Attorney Generals’ race, both of which have razor-thin margins. The central issue involves the human operation of Model 100 Precinct Ballot Counter machines and a failure to follow prescribed procedures issued by the State Board of Elections and the equipment’s manufacturer. Durham County is no stranger to elections controversy. Known for its vast web of progressive networks, Durham is also home to a portion of the high-tech cluster at the world-famous Research Triangle Park. 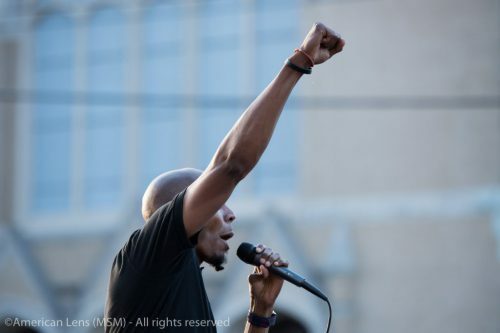 It is also an epicenter to a web of social justice warriors and radical activists such as the Durham Solidarity Center, the World Worker’s Party and is home to its 2016 Vice Presidential Candidate, Lamont Lilly. In late October of this year, Durham County District Attorney Roger Echols referred another case of possible elections tampering to the State Bureau of Investigation. In that case, there were missing ballots from the overall vote totals. It was later reported that an entire tote of ballots was missing and could not be found. The election official in charge of those missing ballots, Richard Rawling, resigned via a hastily written note on March 29, 2016. In this matter, the State Board of Elections eventually allowed 900 people to re-vote. To date, no charges have been announced against Rawling and the case is still under investigation. Additional problems in the 2016 primary persist. In one statement an elections staff member was instructed to “run some ballots twice” to offset other vote totals. Much controversy continues to surround this issue and is part of the state’s investigation. 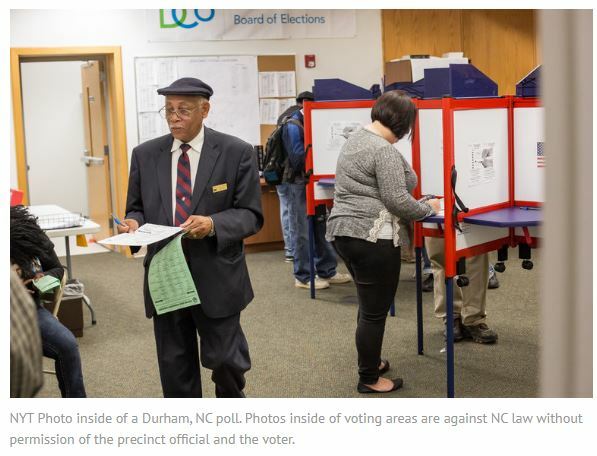 Other issues in Durham include precinct officials allowing an amazing number of photographs of individual voters within the polling place. A quick search of photos on the internet produced a stunning number of photos in the county – more than most other metropolitan areas in the state. The sheer volume of photos taken within the polling locations appears to be a deliberate effort by media outlets to focus their attention on the county. It is a violation of NC law N.C.G.S. Article 14A § 163-166.3. (b) to take photographs or video inside of a polling location without the permission of the chief judge of the precinct and the voter. While permission is assumed to have been granted in each of the photographs, the volume of photographs across the county is incredible. *Note, we have attempted to credit each photographer and media outlet in each of the pictures and include a link back to the original. The first New York Times photograph below was taken on November 1st, 2016 during early voting. Not only is the voter clearly identifiable by his name-tag, but also his progressive voter guide is clearly readable. Photo by Justin Cook for the New York Times. NC Law clearly states that the photographer must have the permission from both the Precinct Official and the voter. Also, precinct books are issued for reference should there be any doubt. This entry was posted in Am Lens, ELECTIONS, Media Bias, News and Observer, POLITICS NC and tagged Carolina Chaos, Durham, Election 2016. Bookmark the permalink.